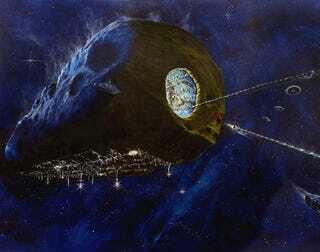 Will Asteroid Mining Destroy The Chinese Economy? Instead of sending people to the Moon, the US space program is sending robots to the Asteroid Belt. When these robots discover metals in the Belt, how will it affect the economy of Earth? Can you put a price tag on an asteroid? Sure you can. We know of roughly 750 S-class asteroids with a diameter of at least 1 kilometer. Many of these pass as near to the Earth as our own moon — close enough to reach via spacecraft. As a typical asteroid is 10 percent metal, Brother Consolmango estimates that such an asteroid would contain 1 billion metric tons of iron. That's as much as we mine out of the globe every year, a supply worth trillions and trillions of dollars. Subtract the tens of billions it would cost to exploit such a rock, and you still have a serious profit on your hands. But is this ethical? Brother Consolmango asked us to ponder whether such an asteroid harvest would drastically disrupt the economies of resource-exporting nations. What would happen to most of Africa? What would it do to the cost of iron ore? And what about refining and manufacturing? If we spend the money to harvest iron in space, why not outsource the other related processes as well? Imagine a future in which solar-powered robots toil in lunar or orbital factories. "On the one hand, it's great," Brother Consolmango said. "You've now taken all of this dirty industry off the surface of the Earth. On the other hand, you've put a whole lot of people out of work. If you've got a robot doing the mining, why not another robot doing the manufacturing? And now you've just put all of China out of work. What are the ethical implications of this kind of major shift?" It seems to me that the economies of Earth might have undergone some shifts by the time we've got robot armies mining the Asteroid Belt. Still, the question is interesting. A number of authors, including Ken MacLeod and Paul McAuley, have suggested that Earth's future economy may become rigidly environmentalist to preserve the planet's habitability. Development planetside will grind to a halt, but old-fashioned dirty industry will thrive in space. So you could wind up with two human economies: A controlled, stable-state one on Earth, and a crazily free market one offworld.